Gorfain Pokamonski genealogical tree, clic to enlarge. Efraim Schlomo (Sleine) was born around 1870's and passed away in 1905, when his youngest son was a year old. He was a wood-cutter and was a land-owner. Once he was coming home in his carriage when he was attacked by robbers. They hit him beside his ear and later on he developed meningitis that took his life. He was married to Sara Pokamoski, born in Ligmian in 1875. 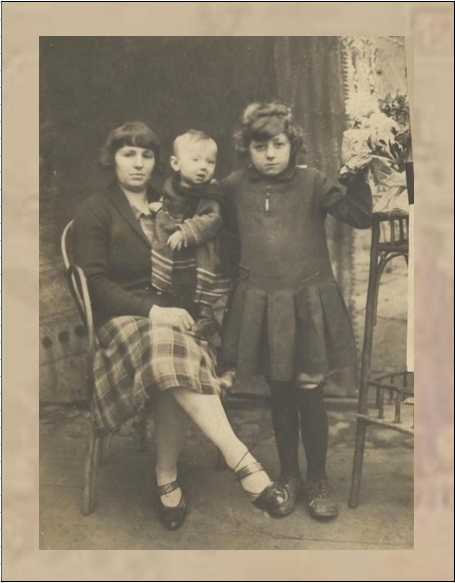 Prior to WWII, Sara was living in Vilkomir, Lithuania, where she perished in 1941. The Gorfains came from Lithuania. I was told that the Lithuanization of the surname, is Gorfainas , so when looking for records, it may appear with the as ending. My grandfather Leizeres always told us that he was born in Vilna, and we took it for granted that he was meaning the capital city. 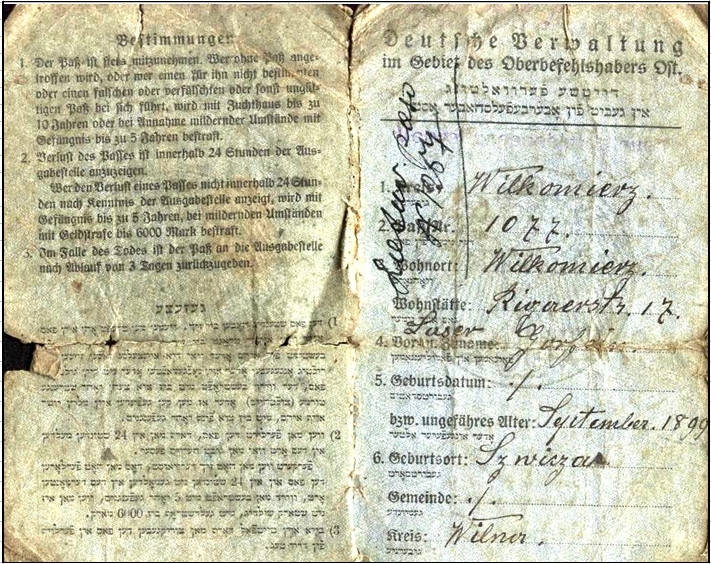 With this information on hand, around 2004, we went to the Lithuanian Embassy in Buenos Aires and requested a birth certificate, giving Vilna as his birth city. 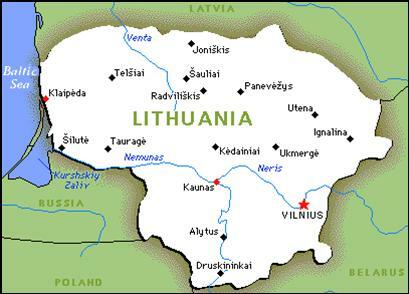 Records were asked to Lithuania with no luck. We tried then, Kaunas and Ukmergé. No luck either. About a year ago I received a phone call from an embassy officer that was coming to Montevideo once a week and was helping Lithuanian descendants with their needs. She said that knowing of my research of family records maybe I would want to have an appointment with her as she may have some information. I went, along with my sister, and there she told us about embassy records that were lost during WWII, recently found and restored. These stated that when my grandfather and family arrived in 1930, he said he was born in SIRVINTAI (Sirvintos). 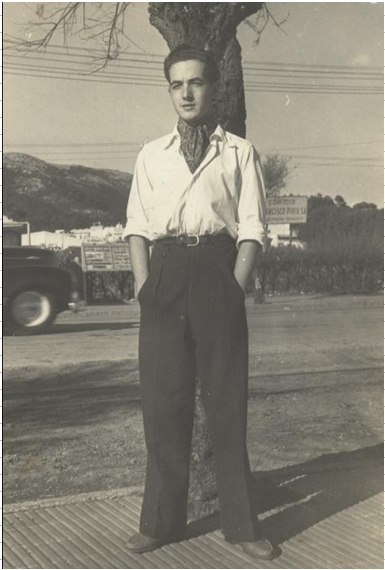 Leizeres Haim was born the 21st of September 1899 and passed away the 19th of July 1965, because when trying to catch the bus, he felt and the bus ran him over. I contacted the "Uruguayan Red Cross" as I have heard that once, they were trying to locate familiars of the Holocaust Victims regarding indemnization. My only aim was to find out the surname of Hitke's husband, ergo the one of her children and find out about their destiny. No luck. I was told that Uruguay keeps no records. Then I wrote to Marie-Agnes Heine, Public Information Officer IOM (International Organization for Migration) claims programs, in Switzerland. The IOM was in charge of making the final awards to Nazi victims and legal successors, so I thought that if Hitke and family where victims, maybe her two brothers over here where contacted and I could get information about them. I never got an answer. 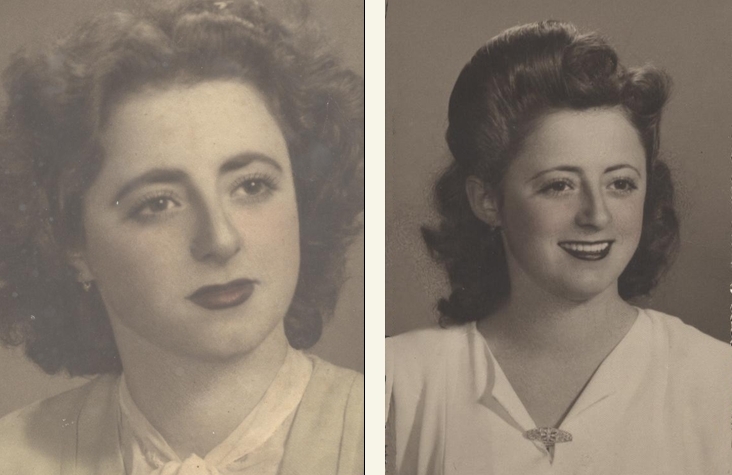 In recent years the opening of archives in Eastern Europe has yielded new relevant archival material, but we must have in mind that many families and individuals were totally annihilated without trace and these names will never be known. 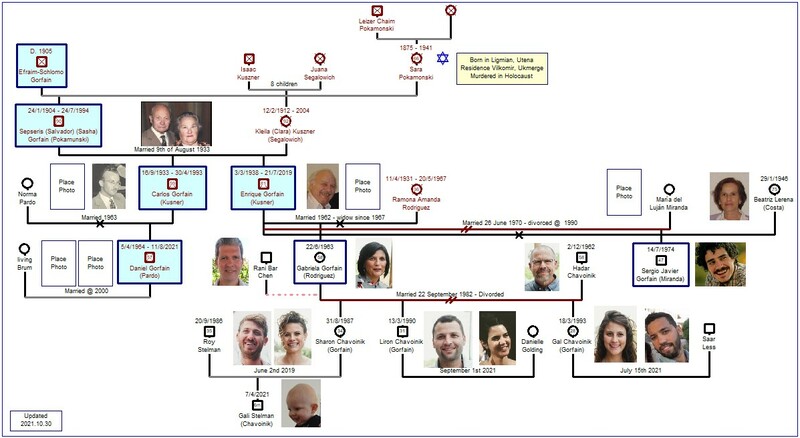 Regarding the ascendant family of Efraim Schlomo, our branch has no records. I am hoping that by corresponding with Gorfains around the world, maybe one day we will find the link that may prove that five or six generations back we all came from the same city and we are distant cousins . Note: Ukmergé was a major Jewish community and in 1923 the Jewish population was 3,885, 37.5% of the total population. North of Ukmergé is Kawarskas, where Rebeca was born, and south is Sirvintos, where Leizeres was born. 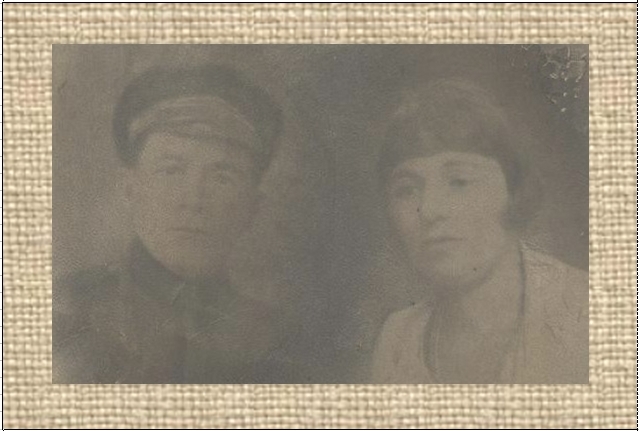 They were married in 1914 (5560 of the Jewish calendar) Their "Ketubath" is one of the family treasures. I would really appreciate if somebody can translate it into English for me. 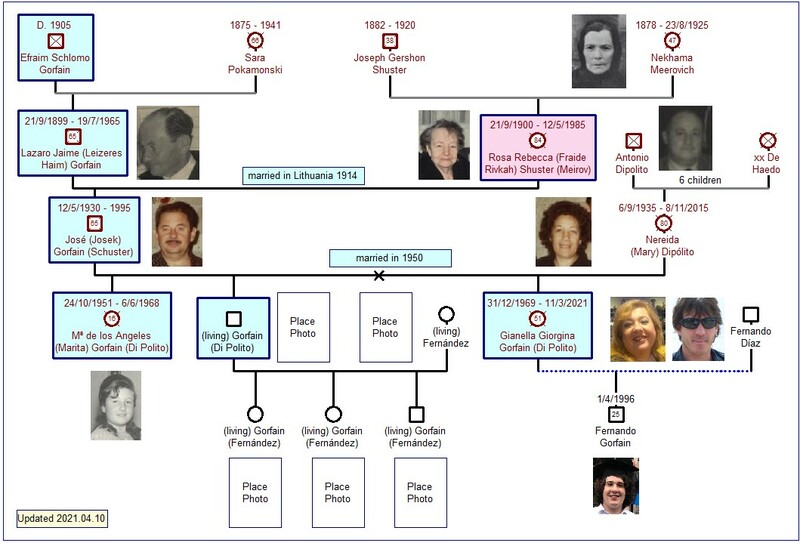 Leizeres-Haim branch, click to enlarge. 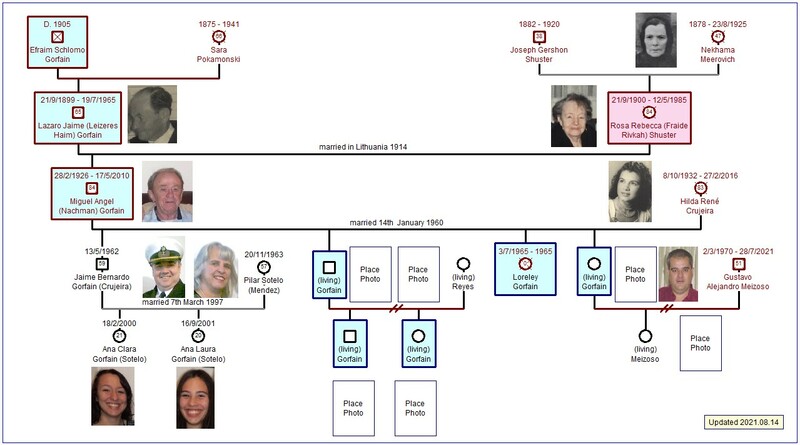 The complete genealogical tree can be viewed on demand by any of the family members. To be able to see it, you must download GenoPro (free version) or buy the GenoProGold. [http://www.genopro.com]. E-mail me your request and I will send you the complete version. 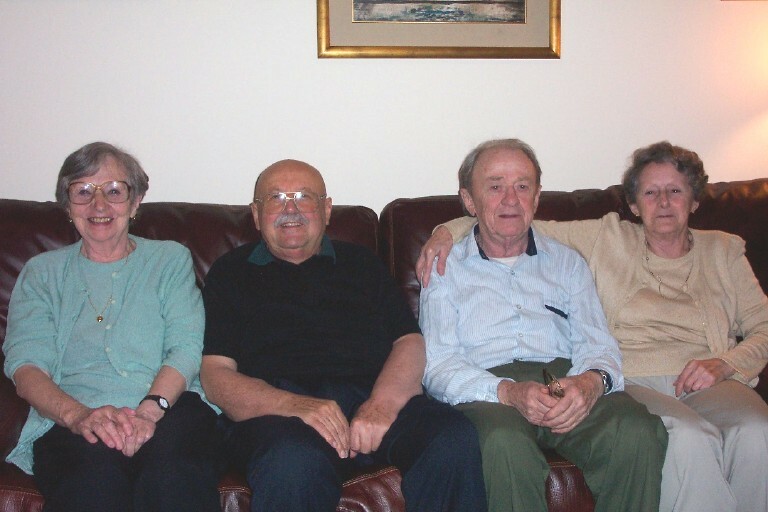 Leizeres, Ricardo, Fraide, Golda and Zlata. Fraide, Leizeres, Tamara and Ricardo. 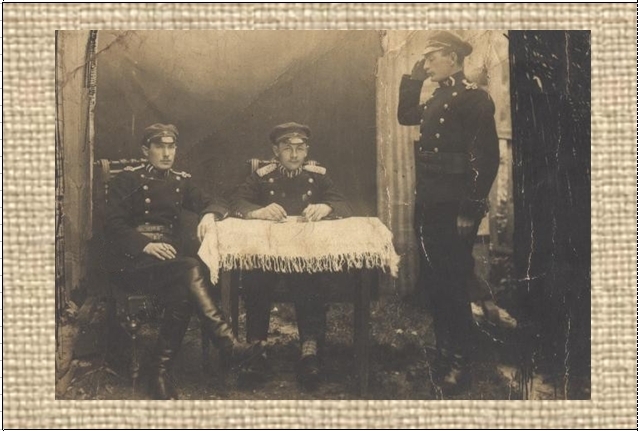 Leizeres, brother in law Tzadik, Fraide and Nachman. 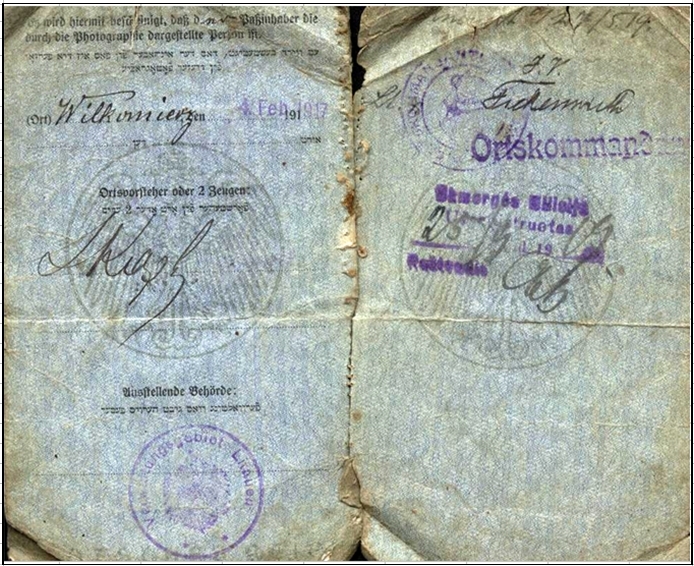 June 1920, the three members of the family had their passports. 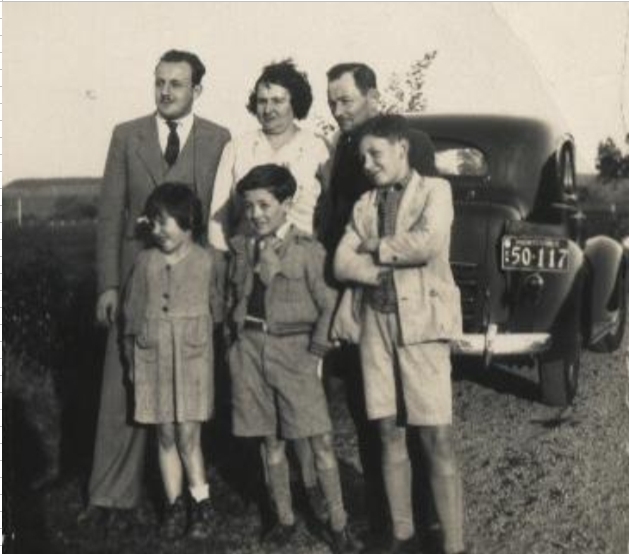 By that time, the eldes sister of my grandmother, Sarah was in Canada. I wonder what happened to them that they did not follow the step of Sarah at that very moment? According to those records, Golda was not born in 1916 and neither was my father born in 1920, because in June he was not included in their passport. I guess we can only especulate because there is no one to ask. 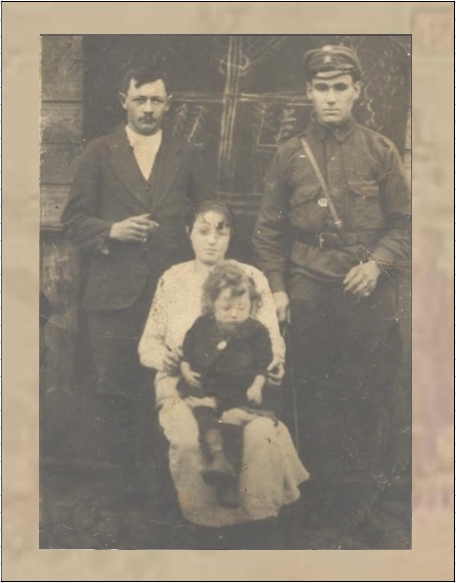 Somebody says that a picture speaks for 1000 words: the picture of Leizeres, wife Rebecca, her brother Tzadik and baby Nachman (about one year old in the photo) was taken in Lithuania. Meyarke migrated to Canada between 1921 and 1922. 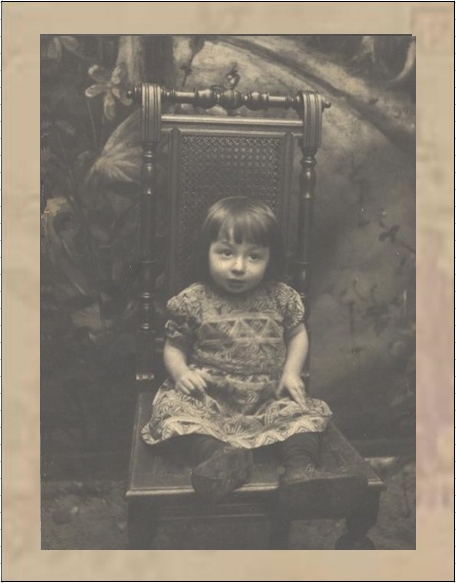 Once Nechamah passed away in 1927, the youngest sibling, Tammara. also migrated to Canada, Was at that very moment that Canada and the States cut the entry of inmigrants so they have to migrate to Cuba? My auntie Nelly told me that they left the city by train, and near the frontier, Taipke said goodbye to them. There is little information about Jews in Cuba until the late 19th century, when a larger Jewish community was formed. In 1906, 11 American Jews founded Cuba's first synagogue, the United Hebrew Congregation, a Reform synagogue that conducted services in English. 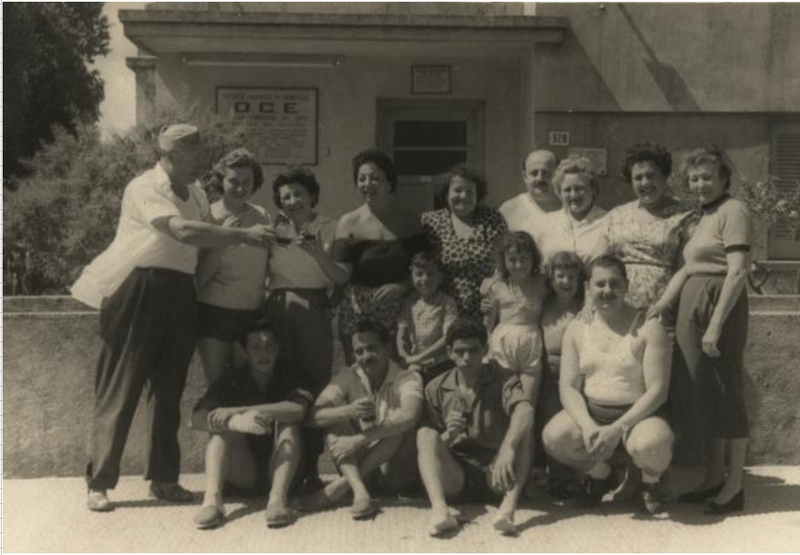 This is considered the official beginning of the Cuban Jewish community. 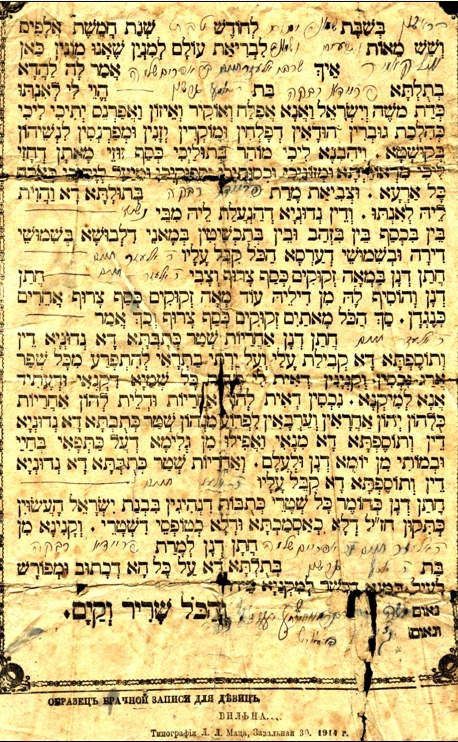 A large number of Jews immigrated to Cuba from 1910 until 1920. 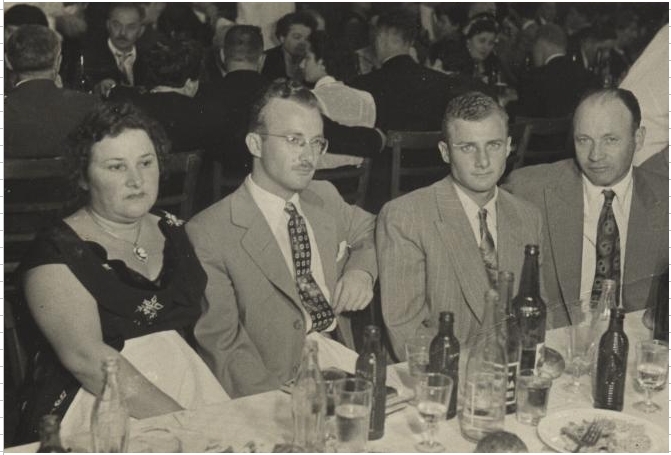 Many of these Jews came from Eastern Europe and used Cuba as a stopover en route to the United States, which had a strict quota system at that time. Many decided to stay since there was little anti-Semitism in Cuba, as well as good weather. By 1924, there were 24,000 Jews living in Cuba. Havana had the largest Jewish community in Cuba. 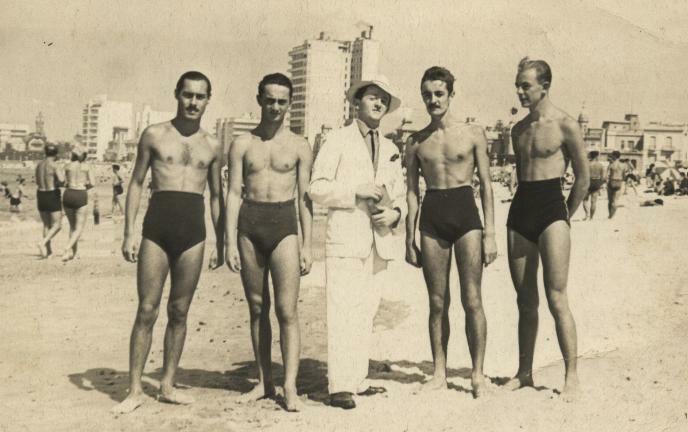 During its height, more than 12,000 Jews lived in Cuba and, of that, 75 percent lived in Havana. Havana had five synagogues, a kosher restaurant, one Jewish high school and five Jewish elementary schools. 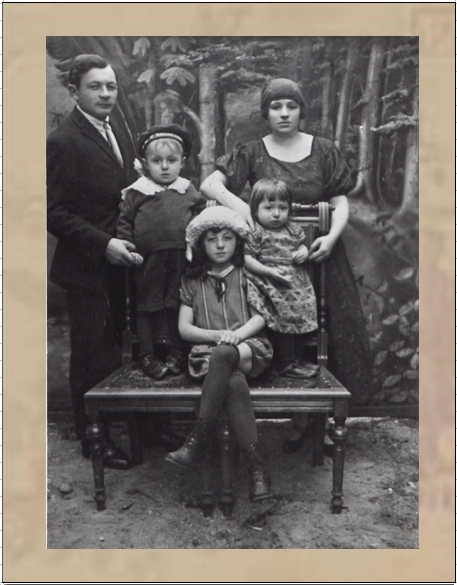 Gorfain Shuster family (Perla, Ricardo, Rebeca, Lázaro, Miguel and Nelly) circa 1928, click to enlarge. In Cuba, Mirel and Josek were born. They lived on a first floor in number 77 San Ignacio St., between Jesus Maria St. and Mercedes St.
Leizeres was working in a kiosk situated inside a hotel. 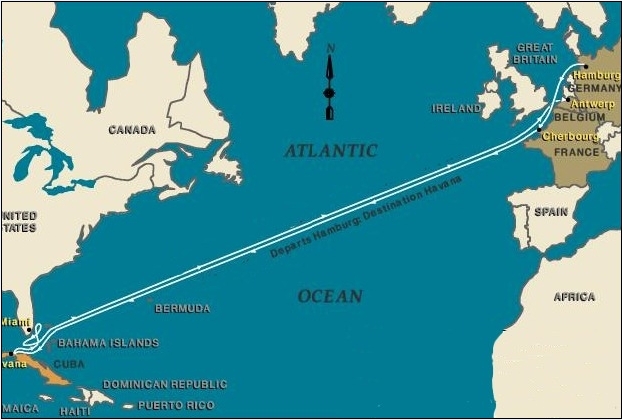 They twice won the lottery with the same number: 1528 The first time, Leizeres gave the money to a ship skipper who was supposed to smuggle all the family to the United States. When he arrived to the port with his family and trunks, the ship had already gone and also all his money!!! Before Josek was born, they bought a ticket from a street lottery vendor, winning again the first prize. 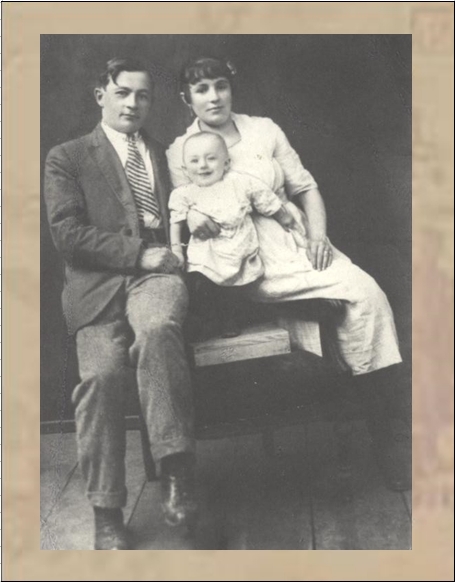 The first days of June 1930 (the baby Josek was 19 days old) all the family members went back to Europe. Leizeres went to the Lithuanian frontier to see his mother that was very sick and the family remained in a hotel in France. 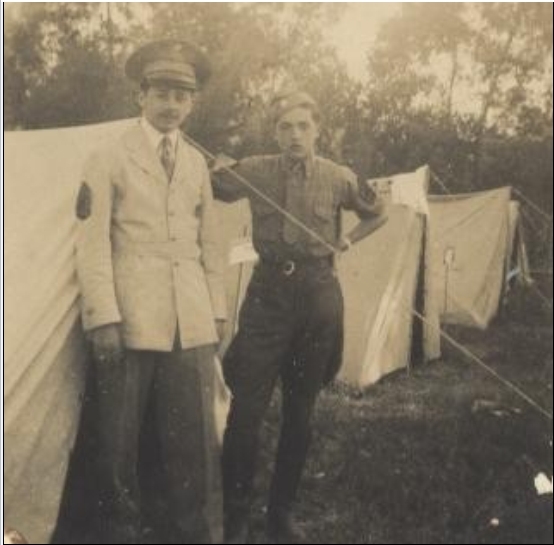 He was afraid to enter the country and not be allowed to leave because Sasha, his youngest brother, was sought by the police for political reasons. Back in France, it is not clear why they were not allowed to go back to Cuba. According to his daughter Nelly, he had health problems that advised not going back to a humid weather. Papers were made in Bremen and they migrated to Uruguay as refugees. Many Lithuanians ended up migrating to South America once the U.S. established immigration quotas in the early 1920s. Ship advertisment, click to enlarge. Bremen Passenger List, click to enlarge. They arrived in the ship Sierra Ventana the 2nd of September 1930. 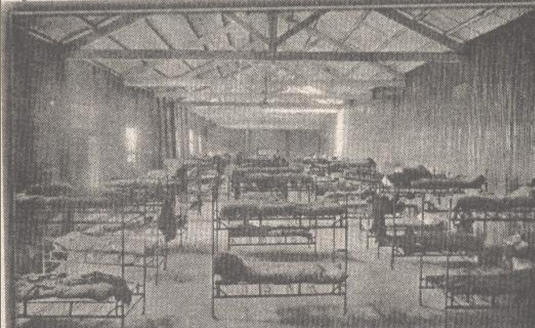 As almost all other migrants, they initially stayed at the Migrant Hotel until they were able to find better lodgings. A card was given to Fraide Rivke(now "Rebeca") and her six kids, which allowed her and the children to have a bed. 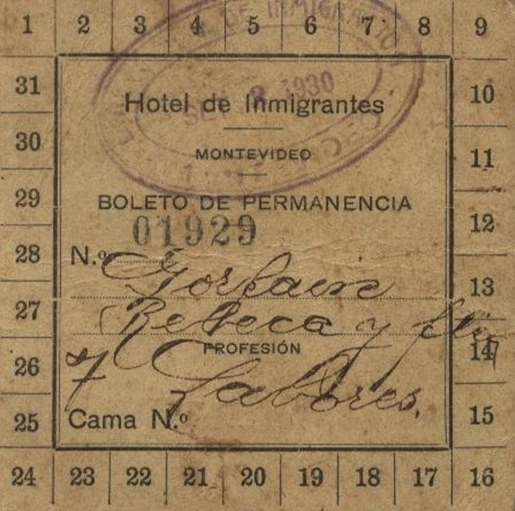 Auntie Nelly remembers that on arriving to the Montevideo dock, their parents were very well dressed: Rosa was in a gauze dress with a "capellina" and Leizeres was dressed all in white, with a "panama hat" and a cane with gold and silver ornaments. Ricardo only remembers he was in a white "captain" suit and he did not like the cold weather as he was used to Cuba's. To be able to leave the migrant hotel, they had to be able to prove that they had rented a suitable place, so Leizeres' brother Sasha (in Uruguay since the year before), found them one that was situated in 1414 Juan Paullier St.
Knowing the glazier trade, Leizeres started to work in one of the biggest glazeries of the moment: Corallo. Life was hard for a family of 9 with only one breadwinner. My own father could only attend primary school till the fifth grade, as he had to work and also help his father. José, the youngest, used to sell lottery tickets in buses. 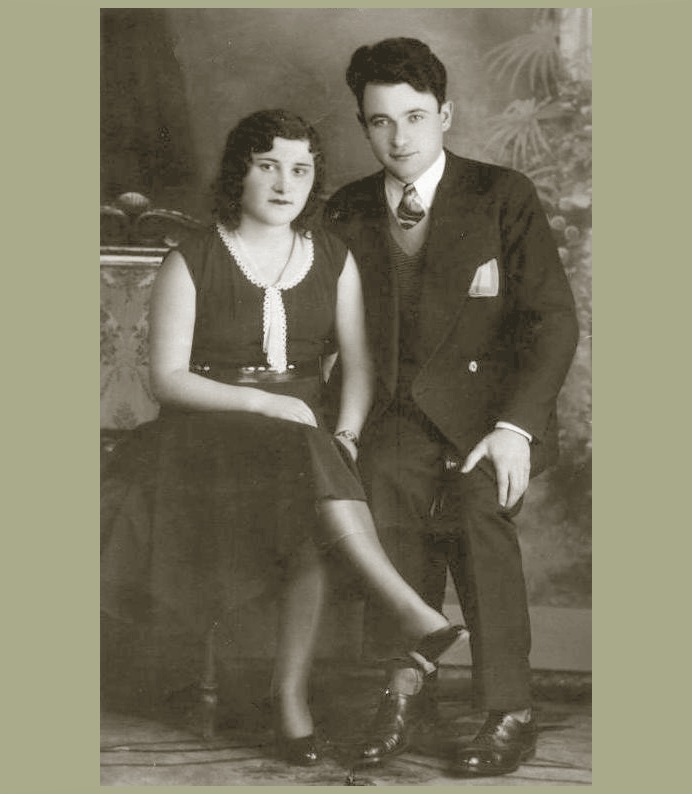 Soon they move to another place: 1377 Gaboto St. and then, a cousin of Leizeres, surnamed Shapiro, gave guarantee so they could rent a house in the in the same street they were living but with space to open a glazier business. Later on, he quit the trade and ran a small grocery store. 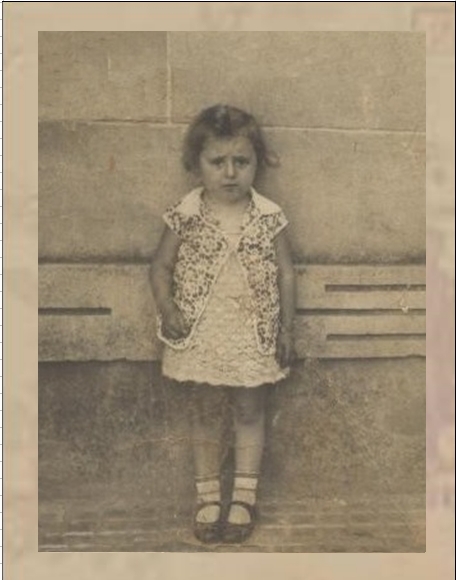 In 1934, 4 years after arriving, the youngest of the siblings, Helen, was born. The gorfain's : Ricardo, Rosa and Jaime (back) - Helen, Carlitos and José (front), click to enlarge. Note : Permission given to display data and pictures. Perla second child, click to enlarge. Note : Awaiting permission to display data and pictures. The second and third children of Fraide were twins. They passed away as babies of pneumonia. The fourth child is Ricardo, my father. Miguel Angel, click to enlarge. 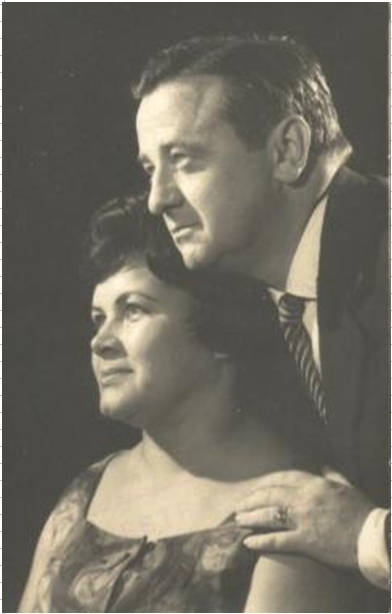 Hilda (Nené) and Miguel Angel), click to enlarge. 1) Antes de que existiese la televisión, el conocido cartoon de "los supersónicos" y el "cambio de horario" para el ahorro de energia, Miguel nos hablaba de que se podía salir en avión de un país a otro y llegar antes de haber salido !!!!! Nosotras, niñas chicas nos matábamos de la risa y no lográbamos entender el cambio de huso horario, por lo cual lo llamábamos "el supersónico", porque siempre nos contaba novedades que estaban mas adelante de nuestra comprensión. 2) Yo tenia aproximadamente 8 años y estaba pasando mis vacaciones escolares en Piriápolis, en casa de mi tio José, cuando Miguel, que a la sazón trabajaba de mozo en un hotel del balneario.nos invitó a almorzar en el restaurante del hotel. El mismo nos sirvió un plato de ravioles y recuerdo que su hermano José se quejó de que con 12 ravioles por plato, nos íbamos a morir de hambre y que tuviese en cuenta que nosotros no éramos clientes comunes, sino su propia familia!!! Habia en dicho comedor una especie de balaustrada del piso superior, donde algunos turistas se arrimaban y miraban hacia abajo a la sala de restaurant. Mi tio se acercó a mi oido y me dijo: "tengo orden de no servir mas de 12 ravioles por plato y desde allá arriba me miran, los cuentan y me controlan" Y yo le creia !!! 3) Hace aproximadamente unos 20 años, dijo Miguel de compartir con nosotros unos dias en Punta de Este, donde a la sazón, nosotros teniamos un pequeño "liquor store" Recuerdo haberle dicho de no llevar mas equipaje que un par de trajes de baño para cruzar a la playa y un abrigo para la nochecita y que por favor no llevase comida, que a cuatro cuadras del apartamento teniamos un supermercado con todo lo necesario para que él y el hermano (mi padre) pudiesen cocinar, ya que yo trabajaba a partir del mediodia en el shopping. Fundamental era no olvidarse de sus tiritas de control y de su insulina. Cuando pasamos a levantarlo por la casa, tuve que ayudarlo a cargar sus dos enormes bolsos, porque no podia con el peso de ellos e insistió en pasar por el camino por una panaderia. Que transportó en dichos bolsos no lo sé, pero si se que se llevó hasta una maquina de cortar papas fritas con forma. Mi hermana drive us to the apartment, nos dejó allí y me dijo: "take care of both of them,good luck to you" y se volvió a Montevideo. Three days later, la llamé por teléfono y le pedí que viniese a echarme una mano, que sola no podia cope con ambos:discutian por la manera de hacer la ensalada, la manera de cocinar y el colmo fue Cuando al volver a la noche encontré 2 botellas de vino abiertas y a mi pregunta de si no podian compartir una misma botella, me contestaron que tenian gustos diferentes!!! Me empecé a preocupar porque Miguel no estaba siguiendo la dieta de un diabético con insulina y a mi pregunta de si usaba las tiritas de control para la orina, me contestó: "las uso, pero las pongo adentro del vino, para testear si tiene mucho azucar o no". Esa noche, no dormí, porque él no se sentía bien y tenia miedo de que tuviesemos que llamar a la emergencia. Luego cuando ibamos a la playa, yo tenia miedo de que las olas muy fuertes de la brava, los tirasen y, entraba al agua con uno de cada mano: por supuesto cada uno tiraba para el lado opuesto !!! The 4 brothers, click to enlarge. That happy days when the four remaing siblings were in good health !!!! 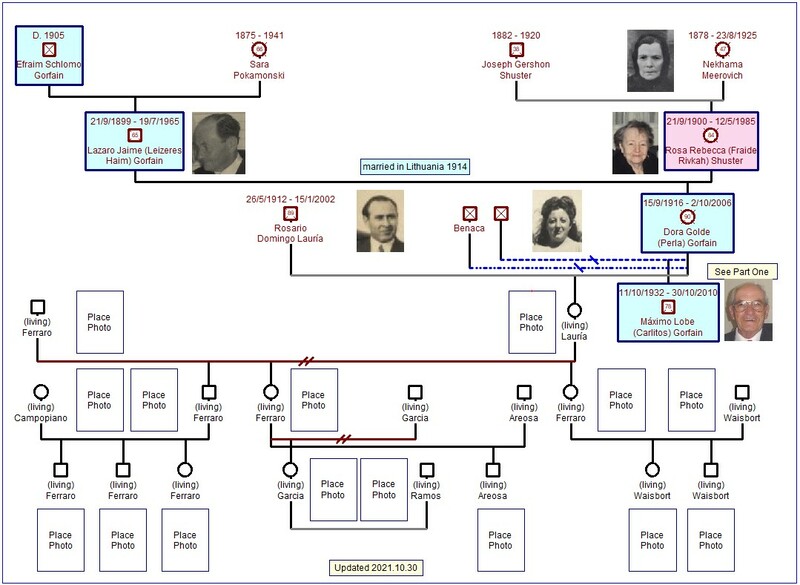 The Gorfains and the Nolls, click to enlarge. 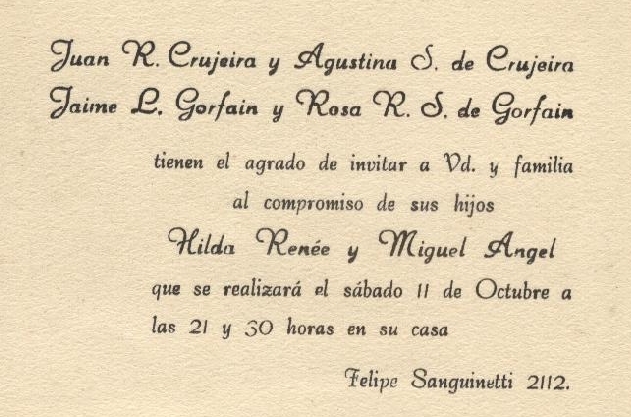 I remember that when I was 8 years old (1952) my uncle José lived with hius wife in Piriápolis, a seaside resort 90 km away from Montevideo, the capital. From there I have beautiful memories, spending my three months school holidays living with them.Every day was a treat, eating icecreams, reading comics. The Noll's and the Gorfains did get along very well and here in this photo both families were gathered in front of his house. Sepseris (Sasha) branch, click to enlarge. Sepseris Gorfain (Sasha) was born in Vilna but because the country was under the soviets, at the time of his birth, he was considered Russian instead of Lithuanian. His son Enrique told us that Sasha used to tell him about singing in the synagogue and also singing at his brother Leizeres's wedding when he was ten years old. He was paid to sing every Shabbat, and one funny anecdote is that one time he could not go to sing but did not want to loose the 2 kopeks he was paid, so he went very early on pay day to be first in the line, gave the name of a fellow singer and cashed his 2 kopeks. We do not know what happened when the turn of the fellow whose name he used came!!! 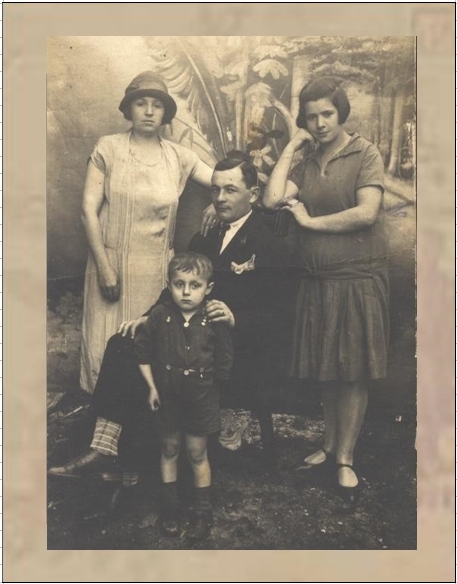 He met his wife Clara who came from Krinski,Poland, married the 9th og August 1933 and built a family in Uruguay. 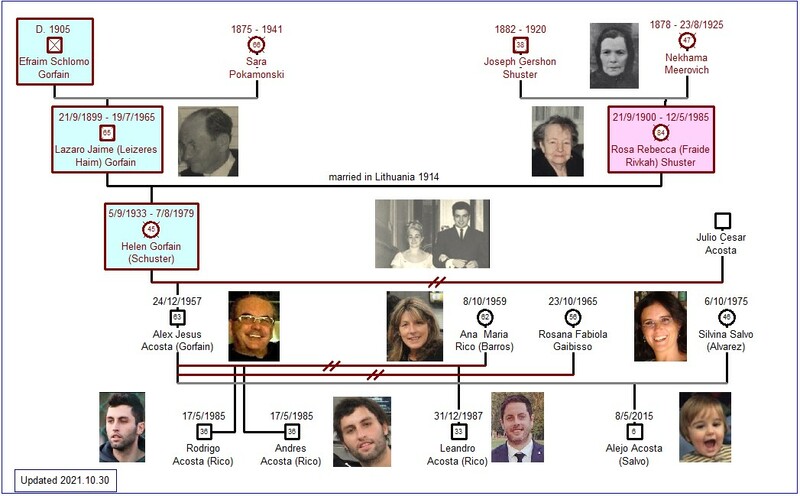 Some of his descendants now live in Israel. Kejla Kusznier Segalowiez was born in Krynki, Poland, the 12th of February 1912. Krynki is a remote Polish farming village on the border with Belarus, situated in the valley of the Krynki River, 45 km from Bialystok. The main road from Grodno to Krakov led through the town. About her parents, her father's name was Isaac and her mother's name was Juana Segalowicz. They had two sons, Carlos and Enrique. Carlos was born the 16th of September 1933 and passed away in 1993. He was married and had one son. Enrique was born the 3rd of March 1938. He had a daughter from his first marriage that married in Israel, where she lives along with her three children. From his second marriage he had a son. Enrique and his third wife live only three blocks away from us, so we can have a nice chat once in a while and share a coffee. 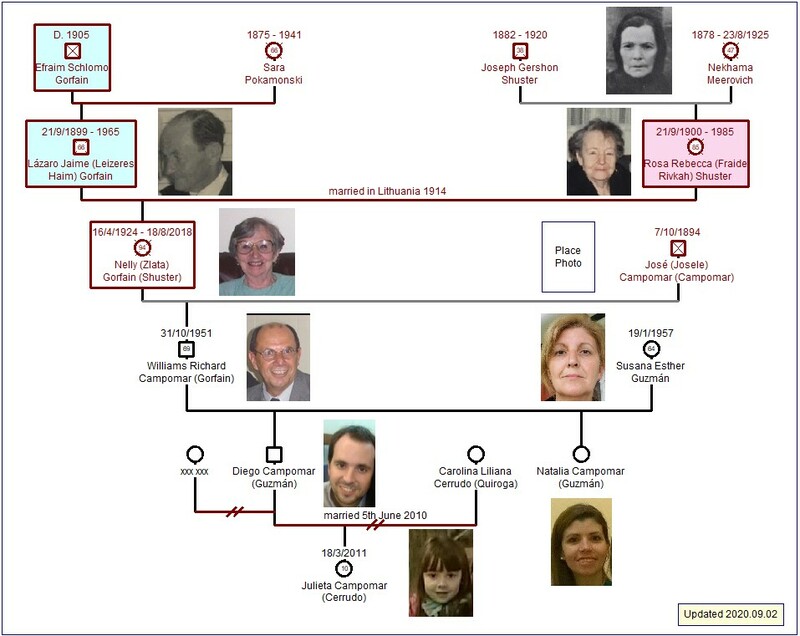 The Gorfains-Kusners, click to enlarge.